After I had attended 4 lectures on Thursday afternoon and the awards ceremony in the morning, I was well ready to call it a day. Jet lag was getting the better of me and I skipped the Moda party. The next 3 lectures I had were on Friday, then 2 on Saturday including the keynote speech and on Sunday just the workshop with Gee's Bend quilters. So let me tell you a little bit about my experience over these days and please remember that this only reflects my opinion. Many of us quilters love our craft so much that it is tempting to turn what is an enjoyable hobby into a full time job that pays the bills. The ladies on the panel have either done that or work in another capacity in the industry. They gave the audience some valuable inside into what it takes to move from "maker" to "making a living" including the not so nice bits. We learned that you have to compromise in many areas, need to find a niche, need to adapt to what your customers want and need to acknowledge that that might not be what you want. That often leads to the question can I live with that ? Message to take home: You don't have to change your hobby into a business. This was a most enjoyable lecture. I didn't know Bill before the conference but found out that he is obviously well known in the industry. He collects quilts mainly from the 70th and has more than 200 and that really makes him an expert in the field. Earlier I had the chance to see some of the 70th quilts on show in the exhibition hall and was rather taken aback by their beauty. During the lecture I learned that many of these quilts were actually made from double polyester knit which really does make my hair stand up on end if I think I would have to wear it. But it was of course the fashion at the time, it was available and so it was used in the quilts. A material that was rather difficult to work with too but oh so colourful. I was really looking forward to this lecture as I absolutely adore Yoshiko's fabric and quilts and own several of her books. 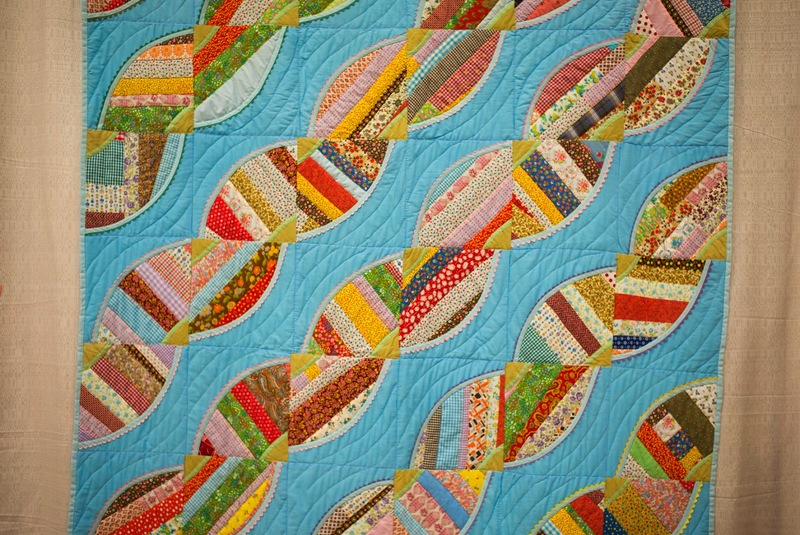 Her quilts are so modern and firmly rooted in tradition at the same time. 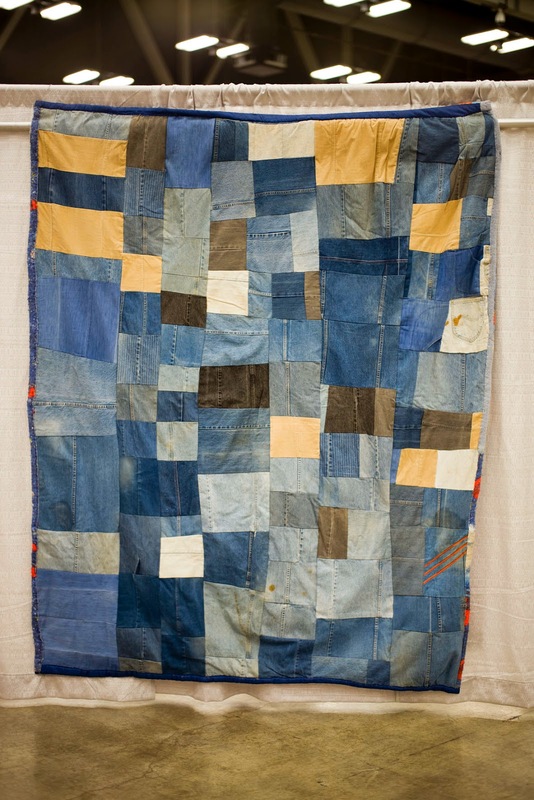 She had one quilt that is covered with sheer fabric hanging in the show and it was much admired and photographed. She took us through her artistic life and showed us photos of her many quilts. Sadly she whizzed through them much to quickly and the audience had little time to admire them. Still it was a great lecture and very inspirational. Alissa is not only the executive director of the Modern Quilt Guilt but also an extraordinary quilter of negative space and champion of minimalism in quilting. She went though her lectures explaining the many aspects of negative space using relevant quilts from the exhibition floor. I thought this was a great idea and gave the audience another reason to have a look at the quilts (which I did). I found her definition of negative space a little prescriptive to be honest. There were many aspects of negative space I hadn't thought about and still don't necessary think about now as such. But it was still very interesting to hear although I left the lecture hall feeling a little "lectured". The keynote speech was one event I was looking forward to and had very high expectations. The Gee's Bend quilters with their wonderful improvisational style are an inspiration to many modern quilters. The previous days I spend time with the few quilts of theirs that were on show and was quite in in auw of them. Sadly there were only very few exhibited. To see the Gee's Bend quilts and meet some of their makers was the major draw for the conference for me. The fact that only few quilts were exhibited (maybe 10-15 only) was a disappointment to me. Gloria Hoppens and 3 other Ladies from Gee's Bend held the keynote speech and the workshop I attend the next day. During the speech they told us their incredibly story. There was much singing and praising the Lord too and the event was at some point in danger of turning into a gospel session and I swear somebody around me said 'Amen' at some point. Luckily a lady in the audience asked a question half way through the 90 minute event and from their on many more questions were asked and the audience finally got a little more information on how the ladies live these days, where and how they quilt etc, etc. It was great event although totally different to what I had expected. The workshop also was one of a kind. We started of with a song and then were just told: Sew ! I can imagine that this might have been rather frightening for quilters who haven't ventured into the improvisational quilting world before. I had luckily and know that you just have to start and let go. Though that is still hard. The ladies walked around the room and gave advice and we talked and laughed and it was great. I enjoyed the conference very much and the few negative aspects I came across were outweighed by the overall positive experience. The conference was incredibly well organised and the only real glitch was at the awards ceremony when the audio/viso wasn't set up. Frankly that was disaster and should not have happened but Jackie did do her best to honour the winners in the best way she could. I loved seeing all the incredible quilts on show and was impressed by the very, very high standard. I too enjoyed the vendor area and above all the tattooist where I had a little new tattoo inked. Will I go back ? At some point yes but not next year to Pasadena and the year after when the conference is in Savannah maybe not either. Although Savannah is one of my favourite cities in the world, it is a royal pain in the back to get their from the UK, actually from anywhere to be honest. I really don't quite understand why the Guilt chooses a city to where the vast majority of people cannot fly directly. I hope you enjoyed my two-part report and I can only encourage everybody who hasn't been to the conference to try and go there at some point. 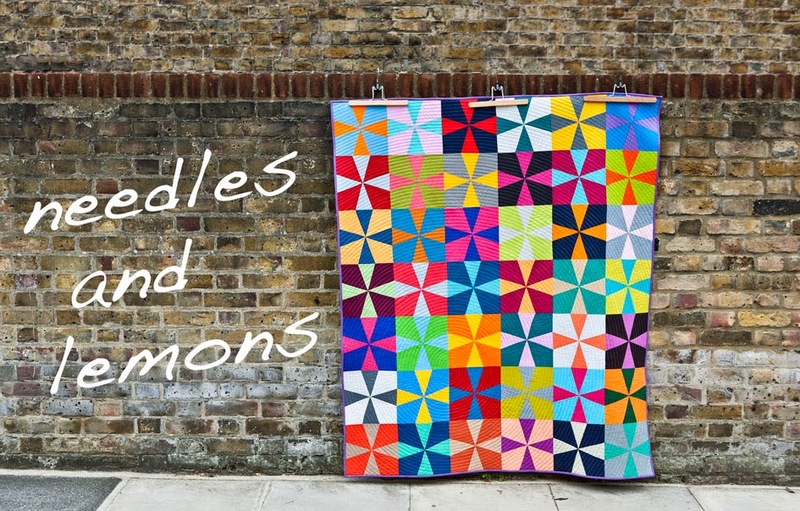 Lovely post and I thank you for sharing your insights, both here and when I got to spend time with you at QuiltCon. I am thinking you should come again soon, maybe you could consider Savannah, extra travel and all. Cool, glad you liked the 1970s quilts. They're pretty groovy. 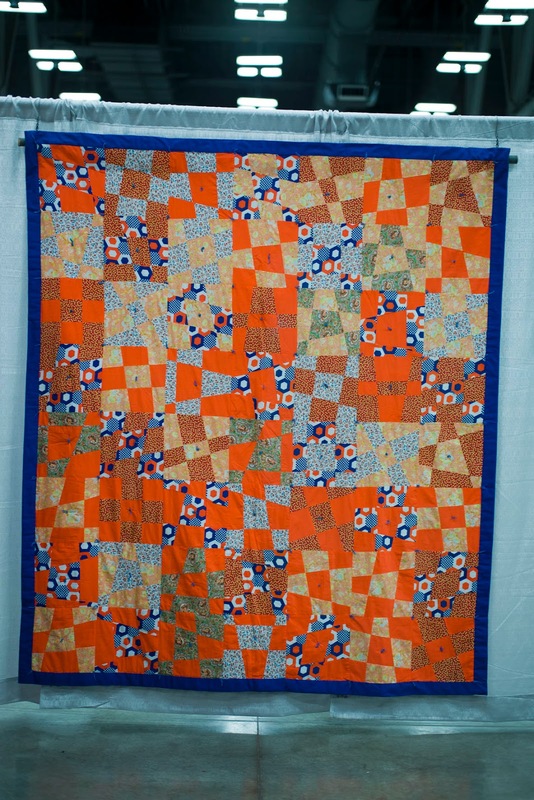 One oopsie in the blog - the orange and blue irregular nine patch is also from my collection, but I'm sure the Gee's Bend quilters love it, too. I recently sold that quilt to a collector in New Mexico. It appears in Rod Kiracofe's new book, "Unconventional & Unexpected..." - Cheers!! Really have enjoyed your posts about Quilt Con. Thank you for giving us your insights. Pasadena is about 25 minutes from Los Angeles International Airport, which has non stops to London.